When you arrive in Croatia, you will be met at the airport and transferred to your boutique-style yacht in Trogir, where a warm welcome awaits you from your captain and crew. Welcome to Trogir. This UNESCO World Heritage-listed city is steeped in history and houses a number of architectural jewels, including Romanesque churches and Renaissance buildings. This evening, settle into your sumptuous cabin aboard our exclusively chartered MS Swallow or MS Lastavica, get to know your fellow guests or explore the local surroundings as we dock centrally overnight. To learn about Croatia’s rich history, start your day with a walking tour of Trogir. Its small, historic town centre resembles that of an outdoor museum, and the well-preserved medieval streets are best explored with the guidance of our expert guides. Charming Skradin is one of the oldest towns in Croatia, having begun to write its history six millennia ago. 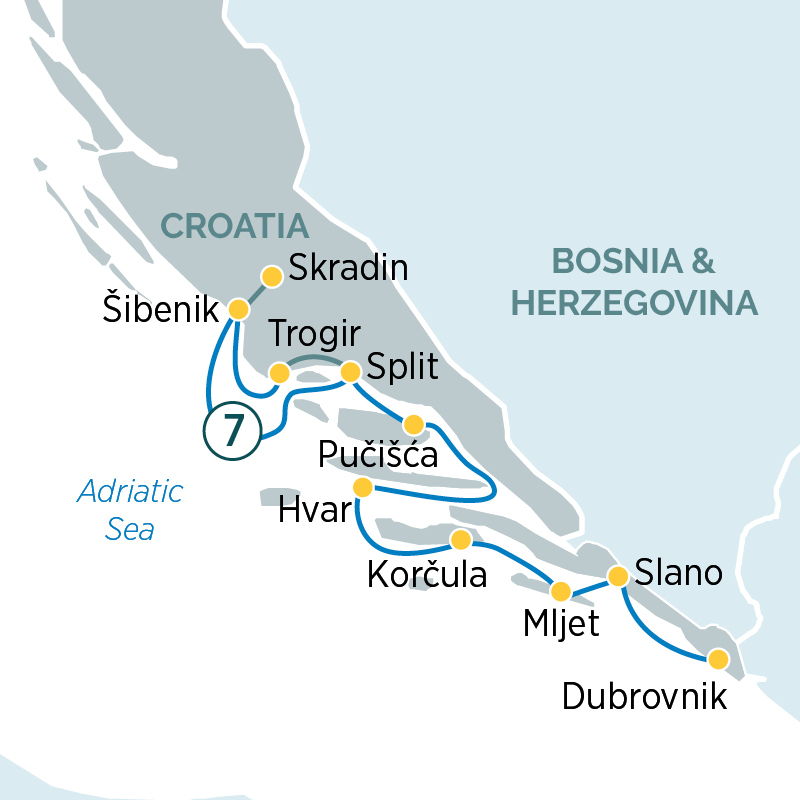 Today we will be travelling slightly further afield to Krka National Park. This iconic spot is known for its waterfalls and gorges, where a series of postcard-worthy cascades are dotted with swimming spots. Be sure to bring your swimwear to really enjoy this beautiful slice of nature. After the tour, return to your yacht for an afternoon cruising to Split. Once you arrive, enjoy a guided tour of the largest city on the Adriatic coast, boasting a fantastic contrast of ancient and modern architecture. Pucišca is a unique coastal town. Strolling through the streets you will see how it has retained a lot of its traditional Mediterranean characteristics. Today you will have the opportunity to visit a local stonemasonry school. Brac was built on this impressive trade and the sculptures that are produced in Pucišca are highly regarded, carved using techniques that have been passed from generation to generation. In the afternoon, sail towards Hvar for a guided tour. With its picturesque lavender fields and cultivated vineyards, the island is considered to be one of the most beautiful in the world. Also known as “Little Dubrovnik”, the island of Korcula is a flurry of medieval architecture and dense woodland. Begin your day with a guided tour of the town, exploring sights of red-roofed houses, quiet coves and sandy beaches. The traditional performances and ceremonies that Korcula is famous for will be sure to delight. Today, you will sail to the picturesque isle of Mljet. Enjoy the pristine beauty of this untouched gem as you explore independently. Alternatively, take a guided tour of Mljet National Park. In the afternoon, return to the comfort of your luxury yacht to sail further on the Adriatic coast to Slano, a village famous for its viniculture and Ston, a city that is known as the gatekeeper of the Pelješac peninsula’s wine empire. Enjoy an included guided tour followed by a wine tasting session. In the morning, cruise to Dubrovnik and witness the beauty of its Old Town, its charm lying on its white limestone streets, Baroque buildings and ancient city walls. A UNESCO World Heritage-listed site, known as ‘the pearl of the Adriatic’, it is sure to amaze you. After breakfast, it’s time to say farewell to your fellow guests and transfer to Dubrovnik airport for your homebound flight.